If you're a golfer looking for the best courses in Houston, here's where to live. Houston, Texas is a haven for golf enthusiasts. The city contains more than 165 golf courses, many of which are designed by leading architects. The country’s fourth-largest city is also home to the Shell Houston Open, a world-class tournament that donates net proceeds to local charities. Active adults can find a wide variety of courses to tee up all over the city, including some near the heart of downtown. 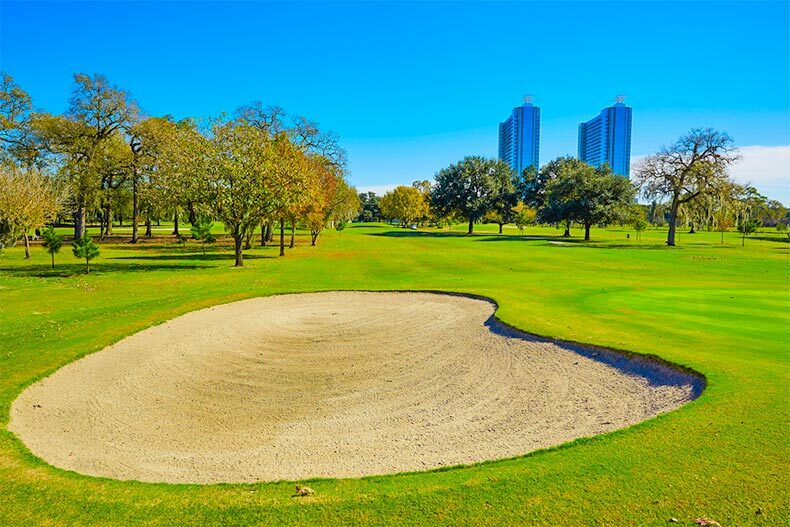 However, some of the best golf courses in Houston are situated near 55+ communities in the suburbs, giving active adults convenient access to top-notch courses right in their own part of town. Here’s a look at some of the city’s best golf courses and the 55+ communities near them. Recognized as one of the country’s best municipal golf courses, Memorial Park Golf Course draws more than 60,000 visitors each year. The course, which opened in 1936, even hosted the iconic Houston Open from 1951 to 1963. Today, the 600-acre course features a lighted driving range, putting and chipping greens, and a majestic new clubhouse. In the luxurious 55+ community of The Lagos at Aliana, residents are never far from exceptional golf. This Richmond neighborhood is just a short drive to the Memorial Park Golf Course, offering residents easy access to Houston’s wide-ranging recreation opportunities. With only 44 homes, residents can stroll through their community and get to know their neighbors by name. Active adult homebuyers can choose from 10 floor plans that range in size from 1,742 to more than 2,700 square feet. Homeowners can take advantage of many exciting events and amenities, such as “Movies on the Lawn” events during the summer, along with a 24-hour fitness center, a resort-style pool with a splash pad, and several tennis courts. At Timber Creek Golf Club in Friendswood, golf lovers of all levels can savor a scenic golf experience across 316 wooded acres. This 27-hole golf facility provides unique views not often found in Houston. Jay Riviere designed the course, which is carved out of oak and pine trees to create the rolling looks of South Carolina. Golfers can also take advantage of a 6,500 square-foot clubhouse along with a well-stocked pro shop, open-air pavilion, and restaurant. Active adults who reside in the gated 55+ community of CountryPlace in Pearland find themselves just six miles away from great golf at Timber Creek Golf Club. This active lifestyle community contains a well-manicured, 18-hole golf course, giving golf enthusiasts plenty of opportunities to play. Here, active adult homebuyers can choose from an appealing mix of single-family homes or townhomes, many which provide stunning views of the golf course or lake. Whether active adults enjoy yoga, tennis, or water aerobics, or they look forward to socializing over dominoes, bingo, or discussion groups, they can easily mingle and make new friends in CountryPlace. Situated just north of Intercontinental Airport, Cypresswood Golf Club offers two exciting golf experiences amidst 600 acres of rolling, heavily wooded terrain. This championship, 36-hole course has hosted many amateur and professional events, including the Shell Houston Open Qualifier and the second stage of the PGA Tour School. Golf enthusiasts who reside in Windsor Hills are just eight miles away on Interstate 45 from a fun day of golf at Cypresswood Golf Club. This age-restricted community is part of the master-planned community of The Woodlands, offering active adults plentiful activities and low-maintenance living. Active adult homebuyers can explore a variety of one- and two-story single-family homes that range in size from 1,733 to 2,738 square feet. Most homes sit on a quarter of an acre and many feature sunrooms and large outdoor patios that are perfect for enjoying a pleasant Texas morning or evening. At Windsor Hills, there’s always something fun on the agenda, whether homeowners participate in ping pong nights or gather with friends for garden club, French club, or bridge club. Golfers can savor the sport seven days a week at Moody Gardens Golf Course, a lush destination that features Papsalum turf and a seaside, tropical feel with billowing palms and natural wetland habitat. The course recently completed a multimillion-dollar renovation that included many landscaping upgrades around the 18-hole course and the clubhouse. Homeowners in The Village at Tuscan Lakes are accustomed to a laid-back, tropical lifestyle. Luckily, they can experience golf with this same tropical vibe at the nearby Moody Gardens Golf Course. This gated, 55+ community in League City offers an appealing variety of clubs and activities for all interests. The community contains a 12,000 square-foot clubhouse along with a library, ballroom, and catering kitchen. Outdoor enthusiasts can take a dip in the luxurious outdoor pool, spend the day fishing at the stocked ponds, or go for an invigorating jog along the neighborhood’s walking and biking trails. Started in 2007, The Village at Tuscan Lakes contains 358 low-maintenance, single-family homes. Active adult homebuyers can take their pick between three home series: Gardens, Classics, and Estates. Homes range in size from 1,109 to 2,581 square feet.